I think I must've been high; very high. Hahah.. Okay I re-reamend. You DO look like Lennon w/o the beard. I was going back in the thread and now saw the pic of why I originally wrote that. Edited 2 time(s). Last edit at 2012-02-11 16:15 by Palace Revolution 2000. I own this and it's a raunchy blues machine! Edited 1 time(s). Last edit at 2012-02-10 14:36 by Roadster32. Edited 1 time(s). Last edit at 2012-02-10 14:10 by GravityBoy. Beautiful guitars Roadster. Very impressive. Are you the original owner of any of those? 1998 Epiphone Firebird (Sunburst) with Duncan Antiquity II pickups and Gibson pots, wire to master tone and volume control. Tuners have been replaced. 1999 MIM Standard Strat (Midnight Wine Red) with Fender Custom Shop '54 Strat pickups and Warmoth nitro-finished maple neck with "Clapton" V-shaped profile. Wired to volume and master tone controls. 2001 Epiphone Les Paul Standard (Cherry Sunburst) with Gibson Burstbucker III and I pickups, and Gibson pots wired to master volume and tone controls. 2009 Fender Road Worn '50's Strat (Sunburst) with Duncan Antiquity I pickups and lowered frets. 2010 Fender American Vintage '57 Strat (Black) 5-way switch installed. 2007 Fender Custom Shop '56 Time Machine Strat Relic (Sunburst) 5-way switch installed. not sure how to post pics but I have a collection of guitars amps and other stuff. I have a rosewood tele from 1969/70 like George Harrison (found in NYC) and an 68 ES 345 as well as a five strats and four resonators...I have played for more than 30 years and I have not sold a guitar in 25 years so the collection is large. Don't know what you mean exactly, but I own them now, that's what counts for me. By "original owner" I meant the first owner...ya know, the person that purchased the instrument when it was new. I don't know your age btw so I'd have no way of knowing if the guitars are older than you are. Regardless though, it's an enviable collection. Love to have a batch like that myself. Awesome. That looks like it received a Clyfford Still makeover. 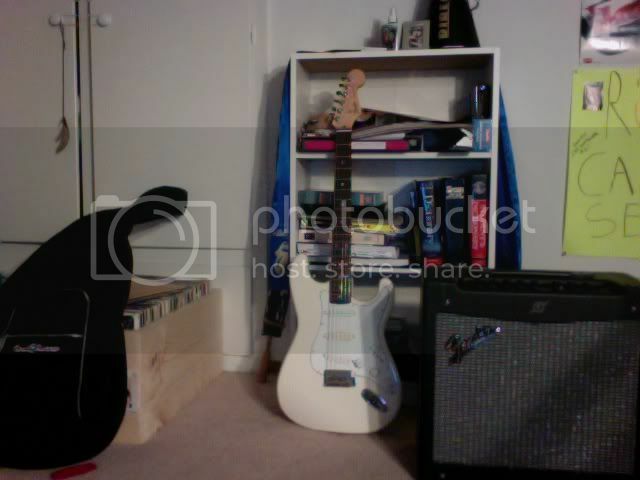 Me and my Highway One Strat. Me and my Simon & Patrick. Awesome man. I love those maple neck '50's Strats. I'm not crazy about rosewood fretboards on Fenders. I don't mind it on Gibsons or other guitars, but on Fender's I just much prefer the look of a maple neck. What years are those from? One of those sunburst Strats looks like it might be closer to a 3 tone sunburst. Edited 4 time(s). Last edit at 2012-03-12 00:35 by carlostones10. Edited 3 time(s). Last edit at 2012-03-12 00:36 by carlostones10. Thanks! They are from '54, '59 and '61. The '59 is a 3 tone sunburst refin (as of '58, sunburst Strats were 3 tone, although with the earlier versions the red was photo-reactive and faded quickly, so many '58s and '59s look like 2 tone sunbursts). Woof! 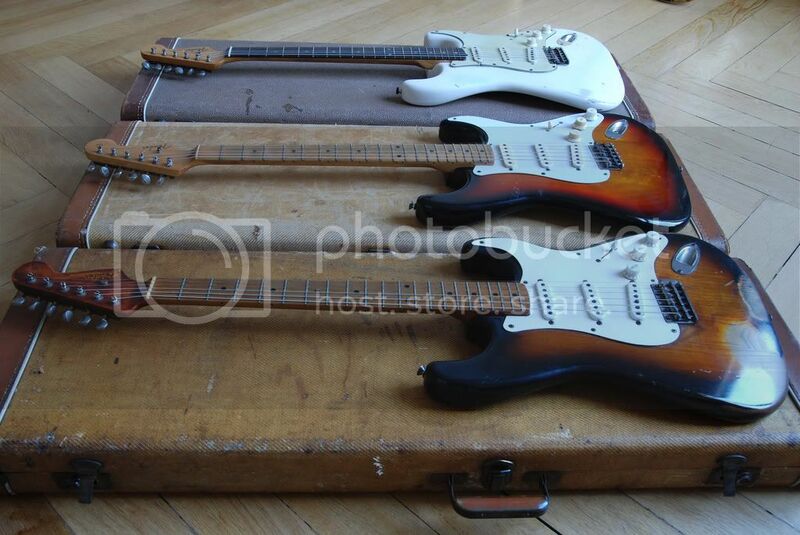 One pre '58, one '58 or '59 and one '59-'61. Did I get the dates about right? Exactly - well done (assuming you hadn't read my last post, that is...)! I had not! I'm a keen guitar enthusiast! Wow! A '54! The first year of production! What serial number is it, may I ask? It's a June '54 one. Its serial number is 0255 (on the neck plate, as opposed to the trem cover, which would have been the case for the very first few Strats produced). Edited 1 time(s). Last edit at 2012-03-13 14:07 by xke38.